Japanese knotweed plants produce female flowers and need a pollen source. However, the plant spreads primarily through rhizomes (underground stems). 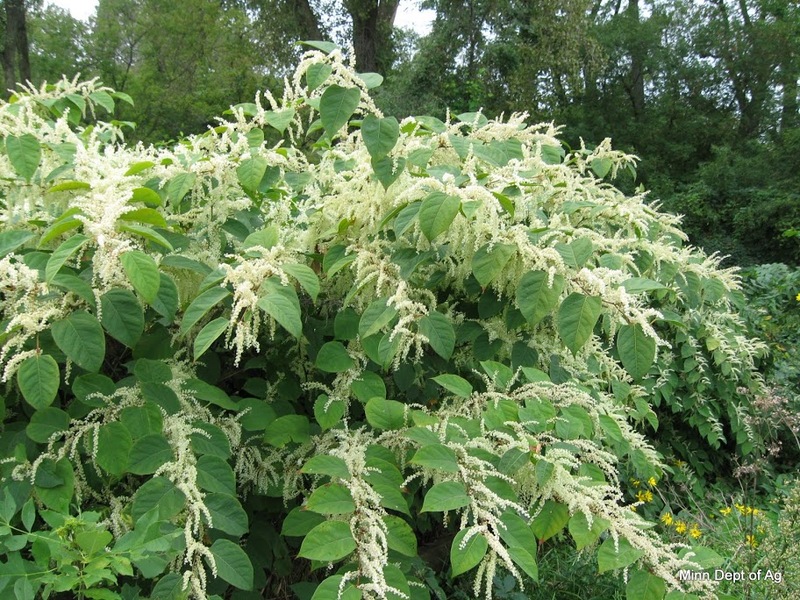 Japanese knotweed forms tall, dense thickets that shade out and displace native vegetation. It takes over residences, community recreation areas and stream banks, degrades habitat for fish and wildlife, can alter waterways, and facilitate erosion and flooding, and to top it off--become a fire danger. Knotweed growth through pavement cracks and along paved surface edges can even result in damaged pavement. Persistence is key to get ridding of this weed, which the Minnesota Department of Agriculture includes on its specially regulated list of weeds. Mechanical control: Try to repeatedly cut it or mow it down once a week. You can also try covering up the plant site with black plastic or mulch. But it can grow through these. Dig out as much of this rhizome system as possible. When new shoots reappear, dig those up, too. Chemical control: You may also try chemical control with glyphosate (Monsanto Roundup) directly on their leaves. But in order for it to work, you’ll need 6-12” of healthy green tissue to be taken up by the knotweed. More than one application may be needed along with repeated cutting to kill this plant. It can take two or three years of repeatedly using the measures above to ultimately get rid of this very, very persistent plant. If it has grown in and amongst rocks, it can be very difficult to remove. For more information, see this article on the University of Minnesota Extension site. You can also learn about Japanese knotweed at the Minnesota Department of Agriculture.